The anchor boys (ages 4-7) meet from 6pm to 7pm. All new boys are very welcome to come and join the company. 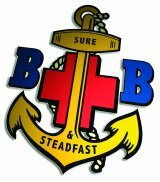 The Boys’ Brigade (BB) is an interdenominational Christian youth organisation, conceived by William Alexander Smith to combine drill and fun activities with Christian values. Following its inception in Glasgow in 1883, the BB quickly spread across the United Kingdom and became a worldwide organisation by the early 1890s. As of 2003, there were 500,000 Boys’ Brigade members in 60 countries. “The advancement of Christ’s kingdom among Boys and the promotion of habits of Obedience, Reverence, Discipline, Self-respect and all that tends towards a true Christian manliness.